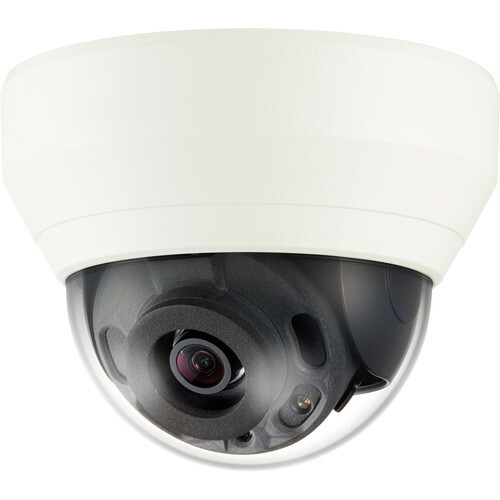 The WiseNet Q 4MP Network Dome Camera from Samsung is equipped with a 6mm fixed lens. It features 2720 x 1536 resolution, WiseStream support, defocus detection, hallway view, one-way audio, and a microSD card slot (microSD/SDHC/SDXC up to 128GB). PoE technology enables you to run just one wire for both data and power for a simple setup, and H.264 video compression conserves bandwidth usage for fast transmissions. Box Dimensions (LxWxH) 5.8 x 5.7 x 4.7"